You are currently browsing the tag archive for the ‘Cambrian’ tag. Everybody loves squid, cuttlefish, and octopuses…and we all love all of the crazy belemnites, ammonites, nautiloids, and orthocones which came before them. But, if you are like me, you have probably been sitting around wondering what came before that. How old are cephalopods, really, and what were the first ones like? Yet, although cephalopods are amply represented in the fossil record from the Ordovician onward, their very earliest origins are shrouded in controversy and mystery. Although there are various fossils which might be cephalopods (or their antecedents) at present the oldest animals to be indisputably classified as cephalopods are the Ellesmerocerida. This order of nautiloids flourished at the end of the Cambrian and into the Ordovician 9approximately half a billion years ago). Although they were definitely cephalopods, the Ellesmerocerida were somewhat mysterious themselves. They were typically quite small—or even minute. They seemingly had ten arms–although this is a conjecture based on where the muscles attached to their shells (and based on what we know of their descendants). The soft parts of the first cephalopods were not preserved and so we don’t exactly know. Their shells reveal close-spaced septa–closed off interior spaces within the shell, which provided buoyancy. The Ellesmerocerida also had relatively large ventral siphuncles—tissues which pass longitudinally through the septa to allow buoyancy control. So the first cephalopods we know about were more or less built on the same line as the subsequent ones (until belemnites internalized the shells). I wonder what else we will find out about the origins of this fascinating group of animals as we learn more about paleontology. 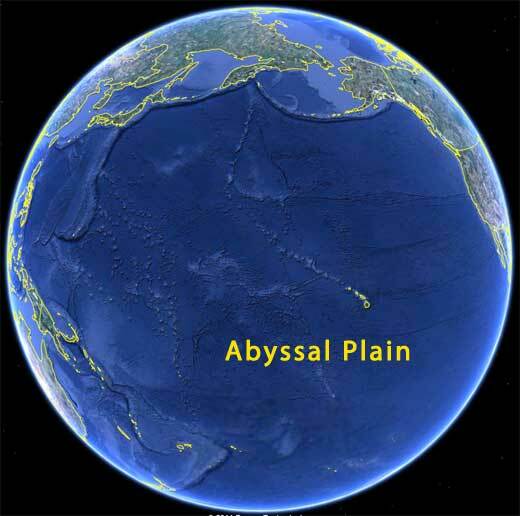 Cast your imagination down to the bottom of the ocean—not at a beach or a bright coral reef just offshore, but the true ocean floor—the abyssal plains which cover much of Earth’s surface. Here vast flat swaths of mud lie in black silence. Only the occasional seamount or shipwreck breaks the monotony of plains as big as continents. Tides do not particularly affect the bottom of the ocean. The most violent storms do not perturb the waters. Even humankind’s restless activities, which have so much affected the rest of the planet, mean little here. At first it seems bleak, but soon enough you realize that life is everywhere here. There are spiderfish, lizardfish, deep sea octopuses, bizarre roving sea cucumbers, and all sorts of strange creatures, but we are not here for them. Instead we are concentrating on an inconspicuous worm-like animal. The tiny cylindrical creatures are only 5 cm (2 inches long) and they shimmer strangely when exposed to light. It would be reasonable to assume that they were worms or tiny sea cucumbers, but they are not. The benthic beasts are members of the aplacophora class of mollusks—the naked mollusks. They are presumed to be similar in appearance and nature to the basal mollusks from which the other classes of mollusks have evolved (although both fossil and molecular evidence is frustratingly exiguous). To look at aplacophorans is to see back to the Cambrian (540 million years ago) and to glimpse an even earlier era when the ancestors of the mollusks diverged from the annelids. 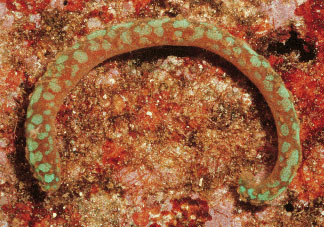 The aplacophoran shine because of tiny calcareous spicules embedded in their skin. There are about 320 known species split between two clades: the caudofoveates and solenogasters. To quote the University of California Museum of Paleontology website, “Caudofoveates are burrowers that feed on detritus and bottom-dwelling microorganisms, while solenogasters feed on cnidarians. 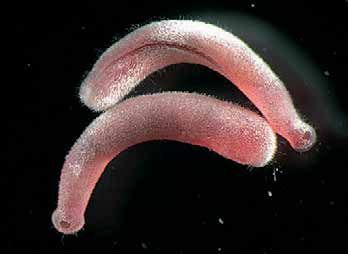 Both groups have a radula and lack true nephridia.” There is an even more important distinction between the two different clades: whereas solenogasters are hermaphrodites, caudofoveates have two genders, and reproduce by external fertilization. The depths of the ocean are known to harbor animals which have vanished from the rest of the Earth long ago, and such is believed to be the case with aplacophorans. For a half billion years they have gone about their business in a part of the world which is resistant to outside change. The next time you fly across an ocean, imagine all of the naked mollusks in the muck at the very bottom and think about the vast amount of time they have been there. Cast your imagination back half a billion years ago to the Cambrian geological period. Although Earth’s oceans were seething with strange experimental life forms, the alien continents were bleak and empty. Huge brown mountains sloughed away into giant canyons. Black volcanoes eroded into naked black beaches. Great flash floods poured over a landscape bare of plants and animals. No horsetails grew. No dragonfly buzzed. Not even a miserable liverwort crouched by the empty streams. But were the ancient continents entirely bare? No—bacterial films and single cell algae were believed to have covered the land, and looming above that primitive slime were the first lichens, symbiotic life forms so hardy that they alone thrive on continental Antarctica today. Lichen is a bizarre composite organism in which a fungus is paired with a photosynthesizing partner (either green algae or cyanobacteria). The thallus of lichen (which makes up the organism’s body) is very different from either the fungal or algal components living on their own. The fungi surround and hold up the algae by sinking tendrils through the algal cell walls (in much the same manner parasitic fungi attack their hosts). By sharing the resources of the two different partners the organism is capable of surviving extreme desiccation, and, when the lichen is again exposed to moisture, a flood of nutrients becomes available to both partners. Lichen dot the face of a Song Dynasty statue on Qingyuan Mountain, China. Lichens’ strange partnership also creates strange morphological forms. In many circumstances these organisms resemble exotic corals, sponges, or plants. 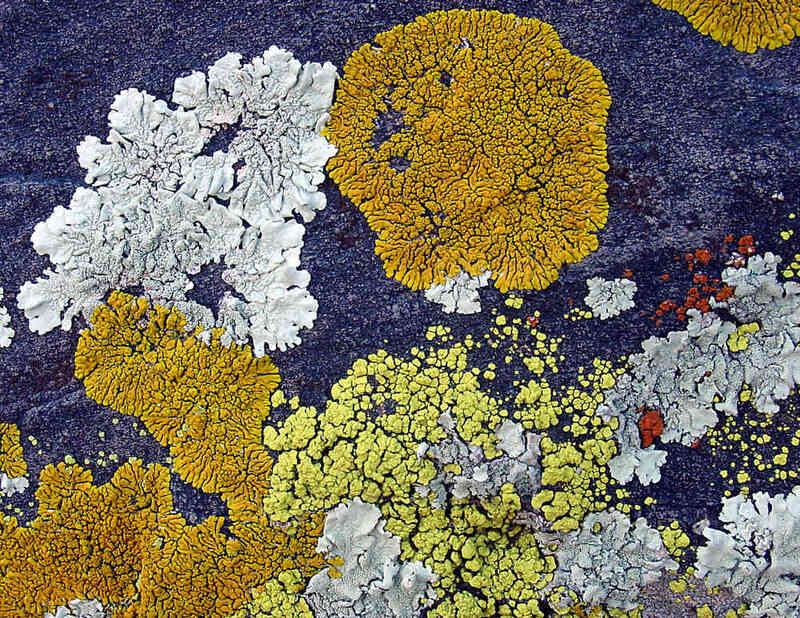 Additionally, many lichens are brightly colored. The result is often a miniature landscape of bizarre beauty. I have included some photos from sundry sources but you should check out the lichen photos at Stephen Sharnoff’s site (even disfigured by the trademark, his lichen photos are the best on the net). 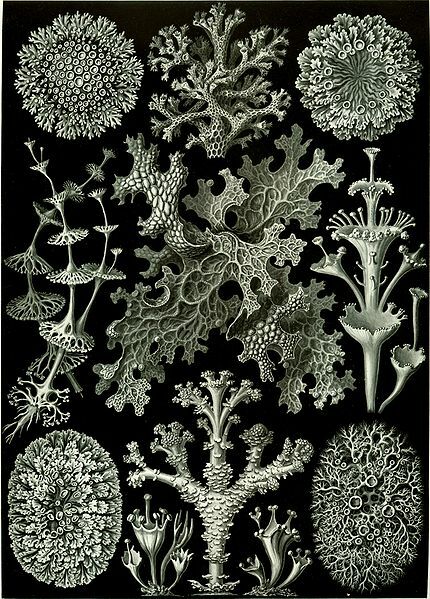 Since it involves both algae and fungi, lichen reproduction can be complicated and takes many different forms depending on the species and the circumstance. Some lichens form soredia, small groups of algal cells surrounded by fungal filaments which are dispersed as a group by wind. Others produce isidia, elongated outgrowths from the thallus which break away. During the dry season, certain lichens crumble into dusty flakes which are blown across the landscape. When the rains come the flakes burst into full growths. In the most interesting and complicated pattern of reproduction, the fungal portion of the lichen produces spores (as a result of sexual exchange and meiosis) these spores are disseminated across the landscape and then must find compatible algae or cyanobacteria with which to partner. Lichens are probably long lived and it is possible that somewhere there are those that make the bristlecone pines seem young and have lasted as long as Pando, but who knows? We have not explored and documented the world’s lichens very completely…or even fully understood the mechanisms of their partnership. 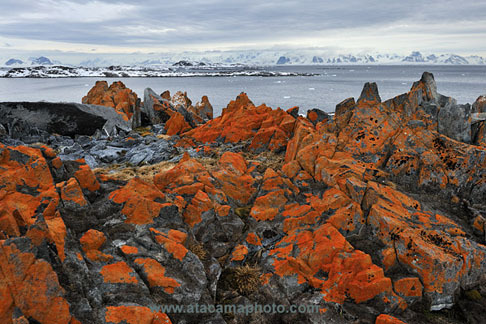 What is certain is that they are one of life’s most efficient colonizers: in areas such as the Atacama Desert and Antarctica, plants cannot grow unless lichen lived there previously (in fact I am going to include this post in my “invaders” category for just this reason). Lichens are also efficient at exchanging carbon dioxide for oxygen, and they are a critical link in the carbon cycle capable of fixing elemental carbon back into the soil and into the ecosystem. 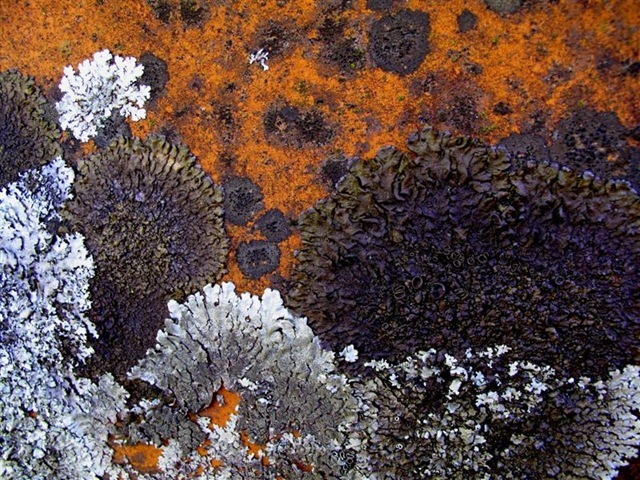 When you look at a tundra landscape and savor the beauty of reindeer, mountains, and arctic birds, spare a thought for the ancient lichen, one of the first organisms on the land and still one of the most important. 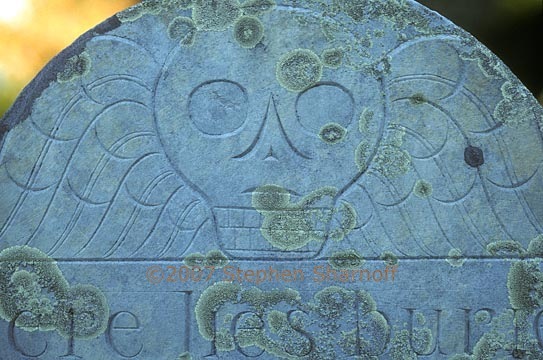 Lichen slowly colonize a New England gravestone from the 1700's.